Submitted by ken on January 17, 2007 - 2:07pm. 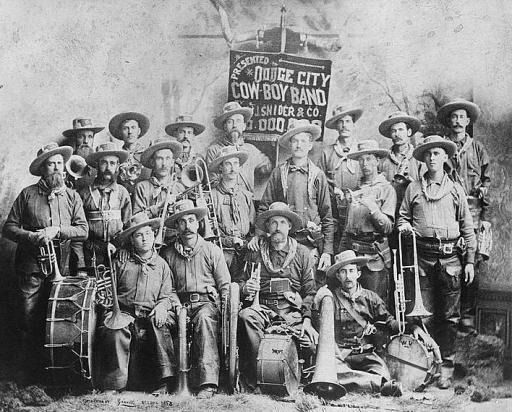 Members of the Dodge City, Kansas, Cow-Boy Band pose with their instruments while in St. Louis, Missouri in 1885. Instead of using a baton, the band leader used a revolver to keep time. Despite dressing in flannel, cowboy hats and chaps, the band was comprised of professional musicians from Denver, St. Louis, Chicago and Kansas City. In 1889 the band traveled to Washington, D.C., to play at the inauguration of President Benjamin Harrison.